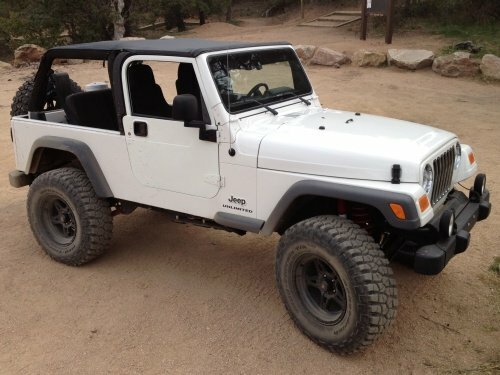 This is a very brief review of my White 2005 Jeep Wrangler Unlimited LJ. 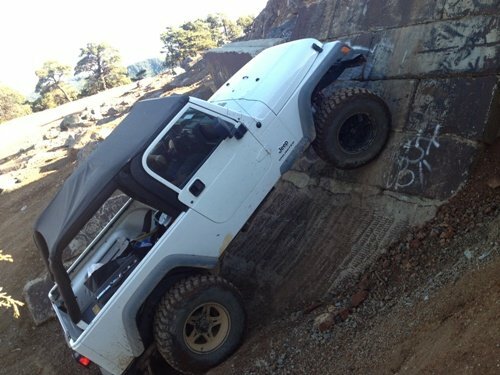 To learn more about my build check out my 2005 LJ Build page. Having come off of a 2009 JK Unlimited (4 Door) I was used to much more space and modern amenities such as power windows, locks, nav, MP3 among other things. Know reading this review that I initially purchased an older Jeep for the more utilitarian and basic needs of building a mostly off-road rig. That being said on the road the LJ performs quite well with quite enough power and pep even with 35s and no regear. Remember the LJs run higher gearing in the rear Dana 44 axle (3.73). This does however come at a price which is gas mileage, where I get on average 10 MPG. When I moved from Arizona to California and drove for two 8 hour blocks, I was towing a small trailer and ended up getting around 12 so I guess it would be possible to get maybe 13 with my setup on the highway. I run my rig pretty rugged with usually only a Bestop Safari Top. During the winter I will run a windjammer and tonneu cover (both also Bestop) but I have issues with the tonneu cover snapping in to the windjammer so when it rains water usually pools up and leaks into the cab. There are a million ways to fix this (like parking one tire on a curb) but since I only do this for a few months it’s not a huge deal. Since I put heavily water resistant Marathon Seat Covers on I simply just roll the seats forward when it rains now and that is fine for keeping it dry when I sit down. Compared to standard TJs the longer wheelbase makes a pretty big difference when driving on the highway during high winds. Its only 15 inches though so cornering is not that impacted though. Plus the added length and Dana 44 axle make towing a lot more reasonable, however backing up is still very touchy. The one big adjustment with the LJ from a 4 door JK is the extreme difference in space. The Unlimited however has much more than standard TJ with a cargo area that can actually fit a cooler, tool bag and other necessities for wheeling or camping for two. With a 3.5 inch lift and 35s I can do all moderate to some hard problems, however without the low ratio gearing and lockers I am limited on certain more technical areas. The size difference is giantly noticeable from a JK Unlimited with the LJ feeling much more nimble. I have only wheeled for short period in a few TJs but from my experience there is not a huge difference on how they feel even though mathematically there is in break over angle among other attributes.